Pacific Riding for Developing Abilities (PRDA), located in Langley, B.C., is a therapeutic riding facility open to all people diagnosed with a disability. It is a “not for profit” and is funded by many donors and supporters throughout our communities. For many years, the RCMP Veterans’ Association, Vancouver Division, has provided a yearly donation which goes towards the care of one of PRDA’s horses. 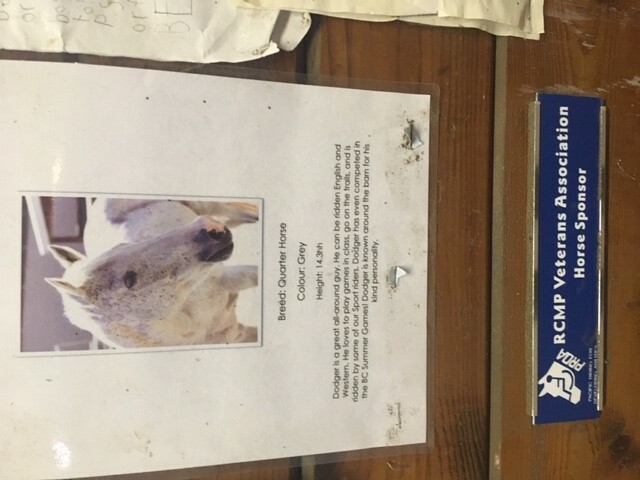 In most recent years, Vancouver Division’s annual donation of $3000.00 has gone towards the care and upkeep of PRDA therapeutic horse, Dodger. In fact, Vancouver Division Treasurer, Rupert Bullock, had a chat with Dodger when he went to visit prior to Christmas to drop off the donation cheque. Rupert has advised that both PRDA and Dodger appreciate and thank Vancouver Division for their continued financial support. Also, for further information on PRDA etc. – Check out our webpage here.